Unfortunately, breaking when it did meant that selecting and installing a replacement wasn't the meticulously sequenced and planned process I hoped for! And more importantly, I didn't get to run my plan by you guys first! I chose a Burnham MPO-IQ 147 with Outdoor Reset, and an installer I'd worked with before, and was happy with his work. I'm pretty happy with the install, and the heat seems more even. It's certainly quieter and much more easy to live with. I'd be so grateful if some generous eyes could look over the install and point out any potential issues before the inspection on Monday, and anything I should ask the installer to tweak before I send the final payment and zip things up. I've included some pictures below. I can take specific pictures of anything you think is worth a second look. My system is 4 zones and DHW. * The boiler temp can often drop to as low as 100F between firings. When a call for heat comes, it can take up to 10 minutes to reach 130F. As near as I can measure with my infrared gun, the return temps on the manifold continue to be near 110F at that point. Should I be worried about condensate? 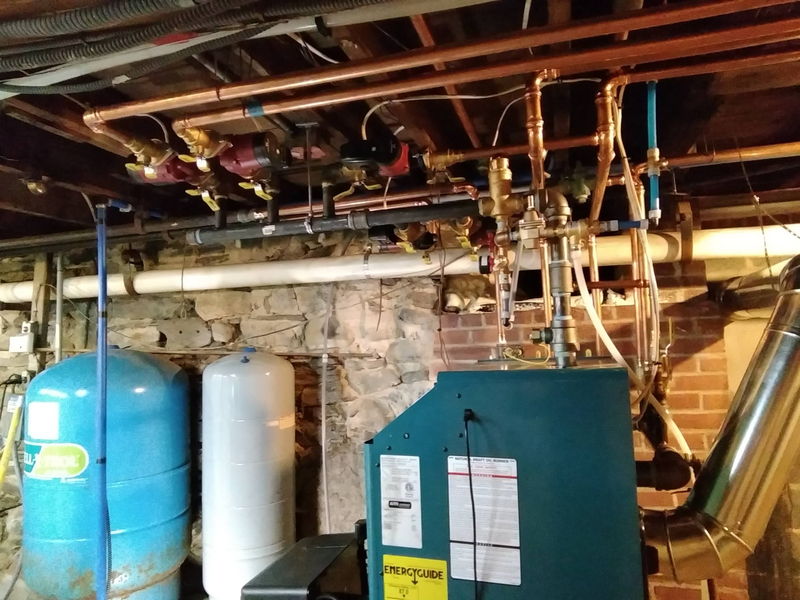 * The near boiler piping is 1" copper, mated to the existing 1 1/4" or 1 1/2" steel piping for the zones. Any issue with that? Where does the expansion tank connect to the system? Maybe a few more pics that show as much as possible in each frame. Was a combustion analysis done with a digital analyzer? What size is the boiler? What's the heat loss of your house and how much radiation do you have? EDIT1. It's hard to see what your arrangement is. Looks like you might have a single pump with zone valves and a bypass? If so consider at least a thermostatic tee instead of just a bypass, even if you don't go full primary secondary. EDIT2 Looks like your bypass is on the wrong side of the pump. It will just allow flow to go around the boiler. You want to have pumped hot water re-enter your return to warm it up. EDIT3 Looks like the bypass is installed as per the manual. But it is ineffective at raising the return water temperature. If you have prolonged low return water temperature, you may want to switch to a primary secondary arrangement, with some sort of boiler protection strategy. In your case, you would simple connect the supply and returns together near the boiler with a set of closely spaced tee's in the bridge. Then install a boiler pump on the outlet of the boiler and a thermostatic tee on the return (and outlet of the primary boiler pump). This will allow the boiler to quickly come up to temperature by decoupling the load (hot supply goes around in a circle in the primary loop until the return is hot enough). There are a bunch more ways of doing this, each with there own pro's and con's. Boiler is DOE 129 MBH, Net AHRI 112. * Measured, corrected for degree days: 97K - 104K. Total sq ft EDR is 1690, composed mostly of radiators, but with two unit heaters in the garage. The expansion tank is connected at the bottom left. I think you may be asking in relation to pump location. Pumps are now pumping away I'll try and capture that in a picture. Combustion analysis has not been done yet, due to time constraints. System is in and heating the house again, and I'll get someone to come and fine tune the burner. @Leon82 Thanks for responding. Is Romex an issue around boilers? I've definitely seen mostly BX on the nice photos of work I've seen on here, come to think of it. It's a circulator zoned system, with 5 circulators - 4 heating zones and 1 DHW. 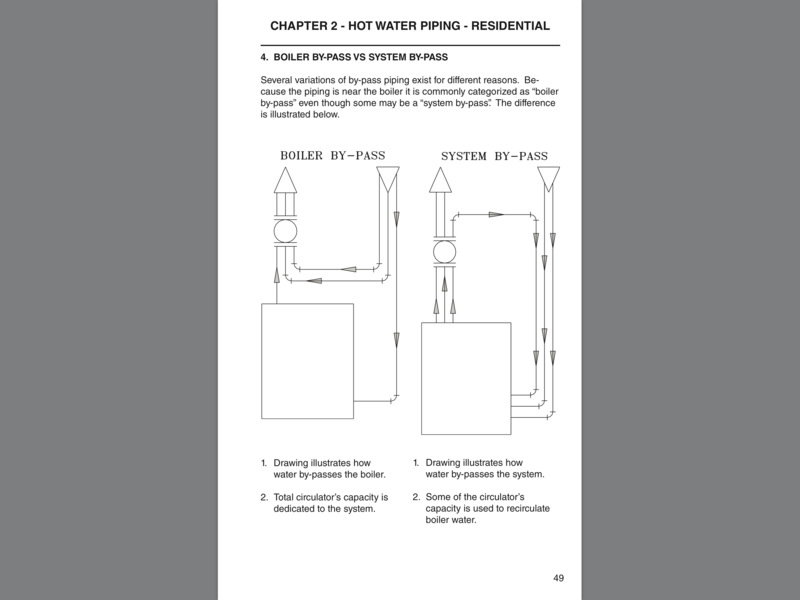 The installation manual shows a boiler bypass, with return water bypassing the boiler, similar to how it's piped. (US boiler discusses that here at item #3. Intuitively, your suggestion was what I thought, and makes more sense to me. Before I ask for a primary / secondary loop, what is the best way to collect data about whether condensate or low return temps are an issue? Hmm, I read it. I'm glad they discuss condensing, but I think the bypass approach may not be sufficient your case. The bypass (as drawn) won't lower entering water temperatures, it just lowered flow rates. I guess the flue temp will go up as the flow goes down since the the average temp in the boiler will be higher. Have you adjusted the flow to give you a certain temp delta? Sounds like you should target a temp delta on the higher end of the suggested range due the extended low return temp period. If you don't get the target delta just by opening the bypass fully, you may have to throttle the boiler valves (below the bypass) a bit, especially since the bypass is undersized. EDIT. looks like you don't have valves between the boiler and bypass. You'll need to add the valves and or properly size the bypass, or upgrade your boiler protection strategy to something more capable. Plan B (a bit of hail Mary) would be to reduce pump speeds to reduce flow. But there's a conundrum can't solve. Elsewhere in the manual it specifies a minimum flow of 8 GPM through the boiler. If there's a 1 1/2" boiler bypass open fully, to match the 1 1/2" manifold, doesn't that mean I need a 16 GPM circulator to get 8 GPM flow through the boiler? That sounds nuts. @SuperJ After firing for 10 minutes, the delta T between the return header and supply header is about 20F (104 F and 122F respectively). The boiler temp is 125F and above where the bypass re-enters the supply the temp is 111F. The valve is fully open, so I can't get a higher flow through the bypass when it's piped as is. 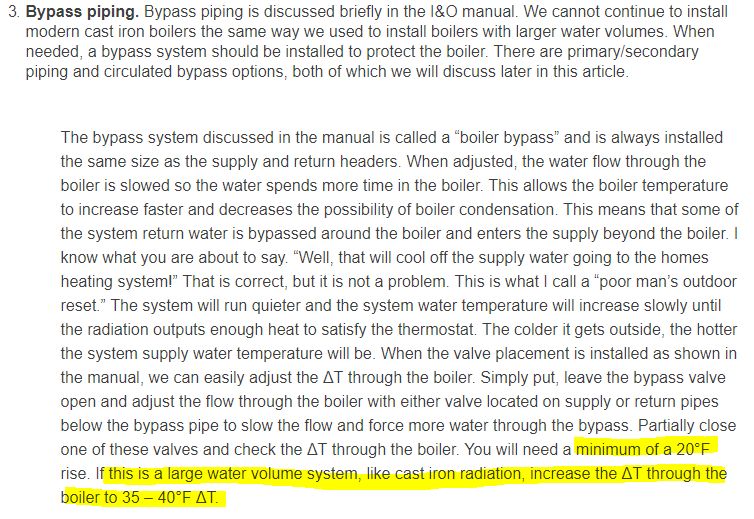 Well, that (the 8gpm min) contradicts with the suggestion to run the boiler at a 35-40f delta for high mass systems. I'd be more concerned about condensation than a specific min flow, but there are protection strategies to maintain the min flow while protection the boiler. @superj Right? You can't both suggest boiler bypass as a strategy to prevent condensation *and* insist on a minimum flow. The only way to do both would be a primary / secondary or similar. Very confusing. If your zone pumps have multiple speeds you could slow them down a notch. This will reduce system flow, and increase the boiler delta a bit. It won't be quite as reliant on the bypass. Just to be clear, primary secondary doesn't on it's own guarantee boiler protection. It just provides a good infrastructure to add boiler protection to. 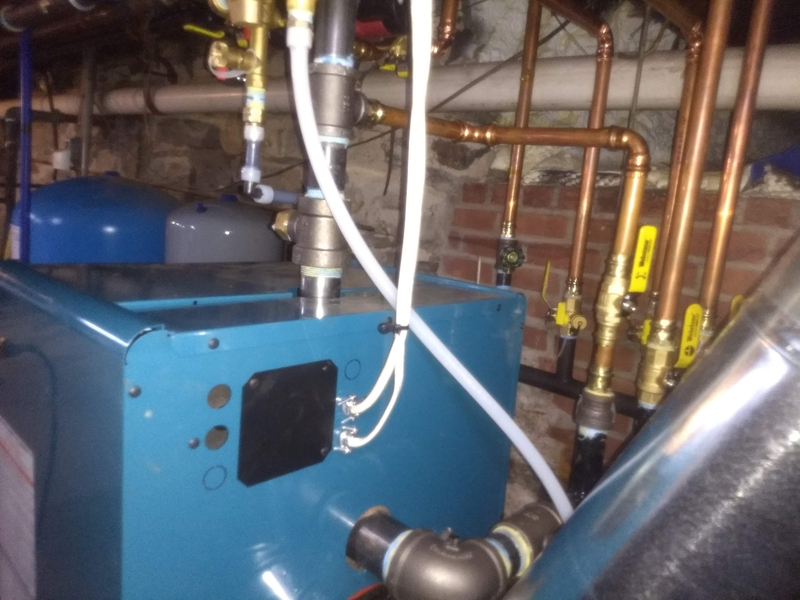 -install a thermostatic bypass valve or protection pump (VT2218) within the primary loop (boiler and primary pump need to be inside this recirc loop). Personally, I prefer the primary/secondary loops with a thermostatic bypass on the return. It's pretty simple, pure mechanical, and doesn't really on a bunch of controls and sensors, and extra pumps. The boiler should have a min. return temp of 135 within 5 minutes of firing. I don't see a thermometer on the return entering the boiler. Boiler protection with min. return temps will eliminate condensation and prevent thermal shock. Boiler bypass vs Sytem bypass? The way you're piped is a BOILER bypass. If the bypass loop were on the discharge side of the circulator, then you'd have a SYSTEM bypass. They essentially accomplish the same thing but in a different way. 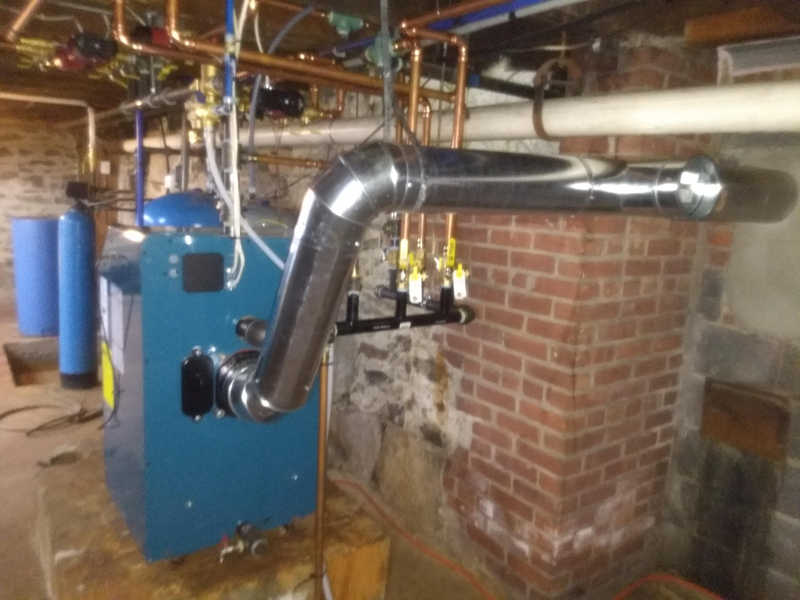 The boiler bypass allows the boiler to heat up quickly by diverting much of the return water back into the supply and thus bypassing the boiler. The system bypass puts much of the boiler's heated supply water back into its return and thus bypassing the system. The downside to this arrangement is that it may deprive the system of its necessary flow rate, particularly if a single circ is used. A system bypass essentially accomplishes the same thing as p/s as far as boiler protection goes - that's assuming it's set correctly. The advantage of p/s is that each circuit can maintain its own flow rate without effecting the other circuit. Your radiation is apparently about 2 1/2 times the heat loss which is good for efficiency and comfort, but it does introduce the issue of flue gas condensation as a possibility. It's been stated that the boiler can withstand 104* RWT. That's the same temp that Buderus allows with their G20 cast iron boilers. Their G20 is actually flexible and they say condensation is not an issue. IDK if Burnham's is the same. Some further investigation is warranted. Another consideration is that you're zoned and much of the time only one or two zones may be calling. This will reduce the flow rate through the boiler and, to some degree, reduce the possibility of condensation. I would get the flow rates on the ZONES as low as possible. Use "auto adapt" and check the delta on each loop individually after they heat up. Also, IDK what type of radiators you have or if the system is a converted gravity. If it is, I would disable the ODR feature of the boiler. Here's why: with ODR, the boiler water temp is gonna be kept low with that much radiation. 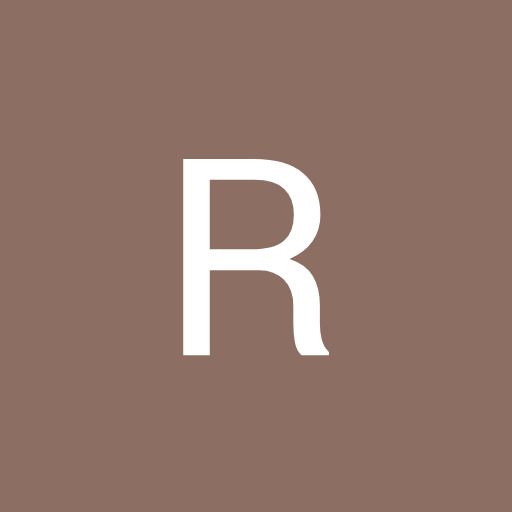 The extra mass of large pipes and/or cast iron rad's will add to that and greatly lengthen the heating cycle. Furthermore, a system with CI rad's and high mass has a natural "reset" built into and seldom requires a SWT above 140*. The thermostat will probably be satisfied long before the boiler limit ever is. This will vary with outdoor temp and load. 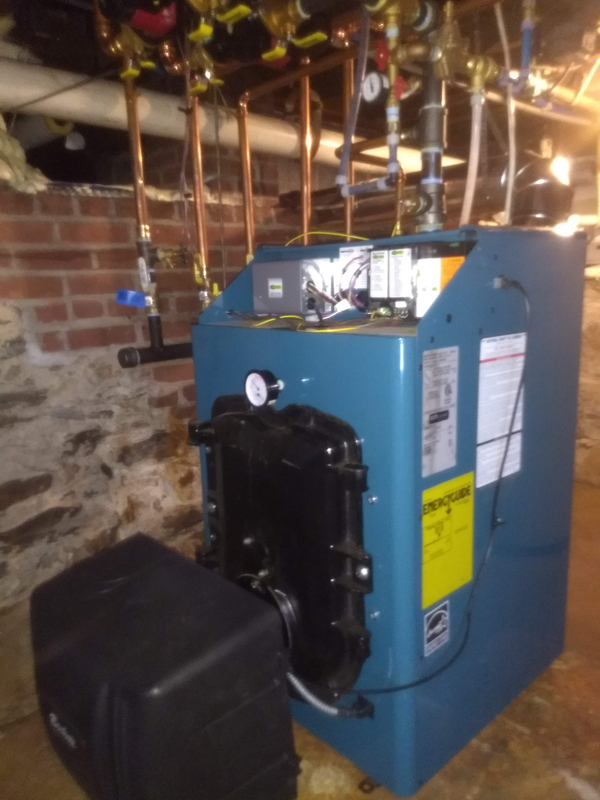 If you're bypass is set correctly and ODR is disabled, the boiler can maintain a high enough temp to prevent condensation while the zone(s) maintain a lower water temp due to the natural reset effect. This only applies if you have a high mass system. Thats certainly not a job to be ashamed of, I've certainly seen much worse. 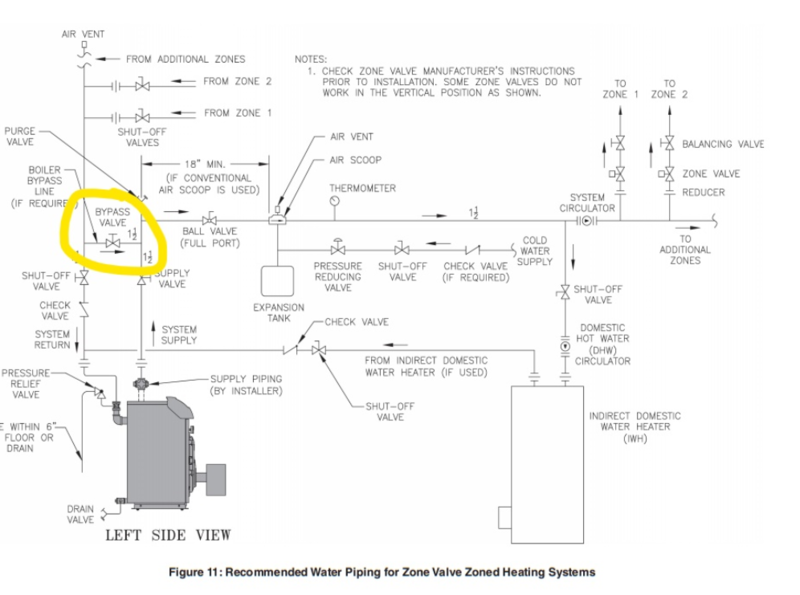 If it were my house I probably would have gone with zone valves instead of circulators for zoning and primary secondary piping with an injection pumping setup or I series mixing valve, either would provide boiler protection and eliminate thermal shock risk. I'd also look into Tekmar controls, you can do a lot with them. I cannot visualize how the bipass in the manual could increase the boiler return temp. It certainly will lower the flow rate to the boiler and increase the delta t across the boiler. Overall it looks like a nice clean install. Only issues I see are the undersized bypass and lack of valves to adjust the flow through the bypass piping. I am not sure what the code says about using armored cable, but I have always thought it was good practice. That's a great explanation of the difference between System bypass and Boiler bypass. I don't think it's a gravity conversion. Looks to me like CI column rads circa 1950. But it's for sure 1 1/2" pipe with monoflo tees. Definitely much higher mass than a baseboard though. I'll take the suggestion about ODR on board. So far this winter has been so mild in New Haven that the set point has rarely gone higher than the 140 minimum anyway. 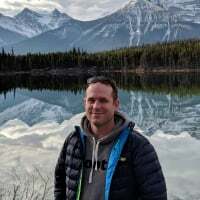 I agree, reducing flow will increase the average temperature in the boiler,but do nothing to raise the return temp, which will reduce condensing, but as long as the return temp is low you may get localized condensing in the heat exchanger. I think the bypass shown is a bandaid that represents a token bare minimum response to protect the boiler. Undersizing the bypass and omitting the boiler isolation valves dooms a strategy that is barely adequate to begin with. I wasn't expecting my old boiler to die so catastrophically. I thought it probably had 10 years to go. My plan for January was actually to re-do it's controls with a Tekmar house control. The only reason I hadn't done that yet was that it was complicated by the fact that the existing circs. were directly wired to 1950s 110V line voltage thermostats, so I had to do a bit of wiring in order to get something suitable for 24V system in place. I was a bit surprised about the lack of combustion analysis too... I'll just leave it at that. The other thing that tingled my spidey-senses is that all the near boiler plumbing is 1" copper mated on to the 1 1/2" existing piping. Are there any issues with galvanic corrosion, and, is it right to have such different pipe sizes on the near boiler piping? I've seen many cases where the piping is over sized. It doesnt make it right. 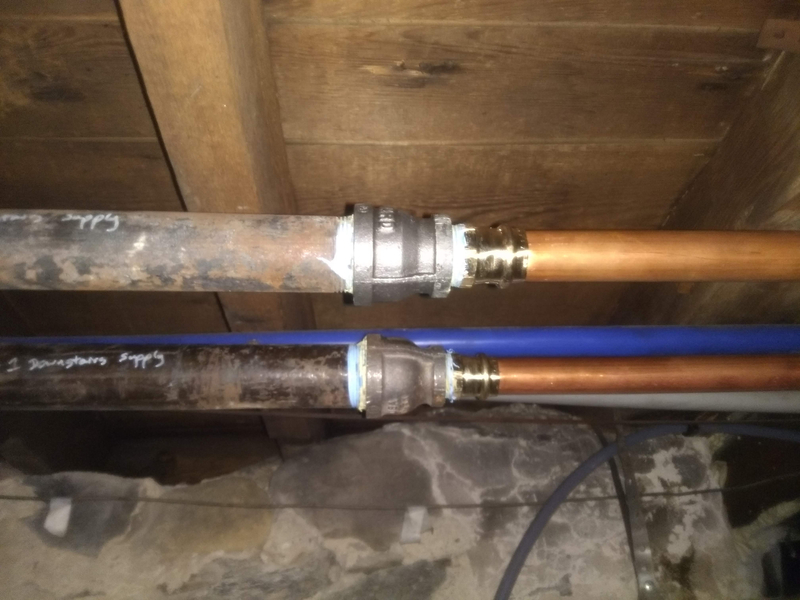 If the load and flow of the zone can be met with the smaller pipe why would you buy larger? I would be surprised if the required flow for those zones exceeds 4ft/sec for 1" (10.9 GPM) the pipe size is probably adequate. Opinion will vary, dissimilar metals usually are not an issue in a closed system. Notice also that the bypass line size must be 2/3 full size when doing a BOILER bypass, but 1/3 when doing a SYSTEM bypass. 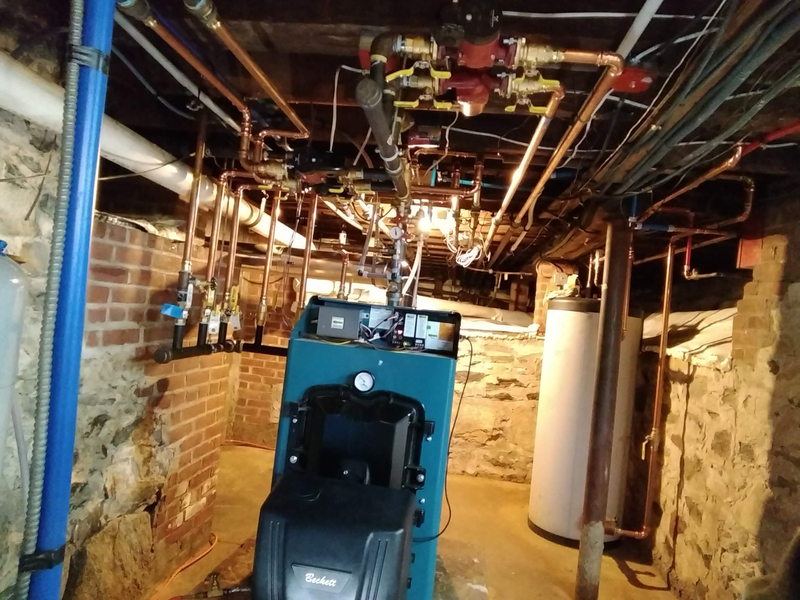 Yours is a boiler bypass and it looks like your guy confused the size with a system bypass. The way you see it,does the drawing depicted in the manual bring warmer water back to the boiler? Not with the boiler bypass, but yes with the system bypass. But the boiler bypass reduces flow allowing the boiler to heat up quicker. 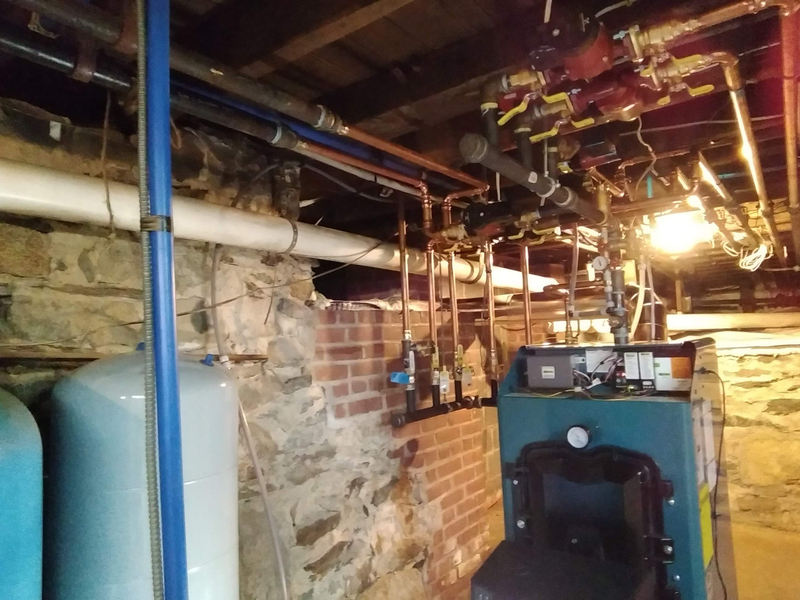 I've measured the delta T through the boiler, and it's between 35F and 40F, as the previously mentioned U.S. boiler article (item #3) says it should be. So, I think in terms of the boiler bypass managing flow through the boiler, things are working as designed. The bypass sizing is 3/4" and each leg of the return manifold is 1", so in most cases, when only one zone is running, it should be plenty. As far as return water temps go, I've spoken with the system designer at the supply house, and he assures me he's spoken with Burhnam about the values I've given him, and things should be fine. 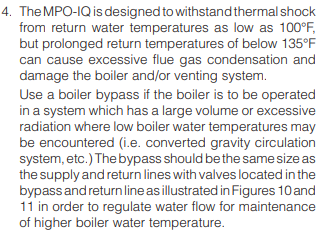 Apparently the MPO has some mixing fanciness in how the return water is injected into the boiler that allows it to deal with low return temps. So, the numbers don't seem at all bad to me. In particular, flue gas temp and draft seem ok, so I'm happy to leave it as is, and look out for any signs of issues at next year's service. @SuperTech I did the combustion test. If you have time to quickly look at it, I'd appreciate your opinion. You asked about pipe size and galvanic corrosion. No need to be concerned. 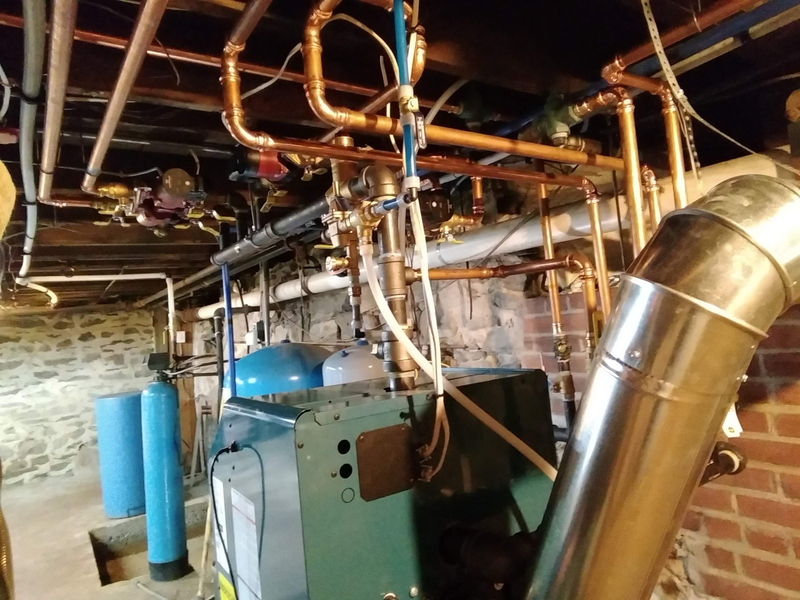 The electrolysis between the brass and malleable pipe and fittings is very minimal, and is a common practice when installing hot water heating systems. If this where a drinking water piping arrangement then a dielectric type fitting is always recommended between two foreign metals. Dissimilar metals conduct electricity at different rates. Through your heating system, it shouldn't be of great concern. As to your 1 x 3/4 malleable fitting reducers? They are also of no concern. The boiler installation manual might give you acceptable combustion numbers? The manual It doesn't specify exact numbers, just a setup procedure. But it does give example numbers in the procedure, and the numbers found for 02, CO2 and draft over fire are right in the middle of the examples. So that's good news.